Great hotel to stay at in Louisville, KY. The only problem I faced was that they did not have the smoking room. Did not have the smoking room I had reserved. It was very clean, was above our expectations we were thankful to be able to find a hotel on such a short notice for the mid America truck show - we will more than likely be back to stay with you again. Not able to get rollaway bed. Very nice room, no thermostat on air conditioning unit and short in the high/low power cool switch on the air conditioner, next to interstate so a little noisy but we slept, outlet behind bed did not work. Pretty clean room. Friendly receptionist and cleaning crew. Kitchen in rooms and nice Jacuzzi tub. Right next to the interstate, kind of loud. 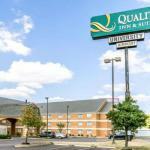 The pet-friendly Quality Inn and Suites University  Airport is four miles from Louisville International Airport and provides a complimentary shuttle between 7am and 4pm. Other items included with the room rate at this three-story, 87-room hotel are a hot breakfast buffet, high-speed Internet access, local telephone calls, in-room coffee, a newspaper on weekday mornings and parking. There is a boardroom and meeting space available for business or social functions. The hotel is close to the University of Louisville. Other area landmarks and attractions include Churchill Downs, Six Flags Kentucky Kingdom, the Louisville Zoo, Papa John's Cardinal Stadium, the Kentucky Derby Museum and the Kentucky Exposition Center which is one mile from the property. All the rooms have a work area with high-speed Internet access, telephone with voicemail, refrigerator, microwave oven, coffeemaker, television with cable movie and news channels, iron and ironing board and a hairdryer. Some rooms have a full kitchen and a two-person hot tub. Non-smoking and handicap accessible rooms are available. This inn has an indoor heated swimming pool and an exercise room. The 24-hour front desk has information on area events and attractions. Other amenities include a business center with copy and fax machines available for guest use, a coin-operated laundry, daily housekeeping and ice and vending machines. The complimentary breakfast is the only meal served here. Restaurants nearby include a Cracker Barrel, McDonalds, Vincenzos 5 and OMalleys Corner. This Quality Inn gets mixed reviews from travelers who stayed here. There were complaints that some of the rooms were dated and needed refurbishing. We still give it a YES rating because many clients had an enjoyable stay. Those who paid a little more for a room with a kitchen said they were able to prepare some home-cooked meals which cut down on some restaurant expenses. Several guests praised the helpful and efficient team of employees and said they would stay here again on future visits to Louisville.